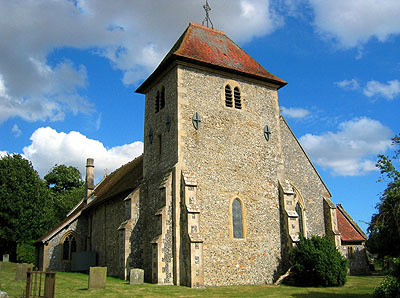 The so-called "Aldworth Giants" are one of the richest collections of 14th century effigial monuments in the country and they are all housed in the tiny parish church of St. Mary. They are unique in being all of one family. Several of them may have been erected at one hit by Nicholas, 'Lord' De La Beche of Aldworth, in the 1340s, though others are older. The family lived at the now defunct La Beche Castle in the parish and held many high offices at Court, particularly Lord Nicholas who became Seneschal of Gascony and Constable of the Tower of London. His effigy is supposedly the one in the centre of the nave: note the detailed stitching of his garments. His father, Sir Philip, is the huge man in the north-east corner with a dwarf companion at his feet to show off his height. Hence the monuments' nickname. Elizabeth I visited this early tourist attraction with the Earl of Leicester, but unfortunately, the effigies were subsequently mutilated during the Civil War. Colonel Symonds spoke of them in his diary. There are some good poppy-head bench-ends and a Jacobean pulpit of unusual cornelis floris design which came from St. Laurence's in Reading. Aldworth churchyard boasts a 1,000 year old yew tree (supposedly the oldest in the country) and graves of the poet, Laurence Binyon, and the in-laws of Alfred, Lord Tennyson of Freshford and Aldworth. Architecture: Mostly early 14th century with an earlier western tower. The chancel is dated 1315. Monuments: Nine members of the De La Beche family (identities debatable) 1300-1350 Effigies. This is not the official Aldworth Church website. Please do NOT mail me about use of the church. Visit the C of E's Church Near You website instead.